Сегодня я участвую в первом блог-хопе сертифицированных преподавателей Altenew. Приглашаю посмотреть мою работу и участвовать в розыгрыше призов! 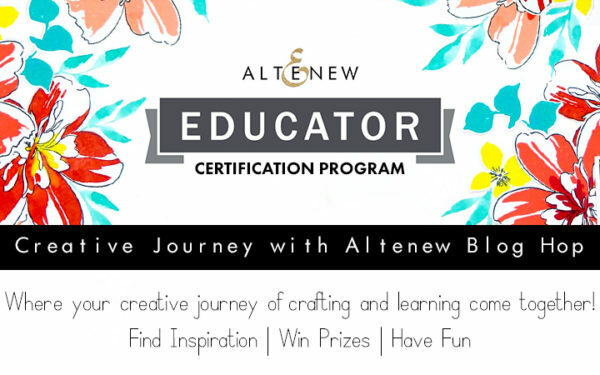 / Today I’m participating in the first Altenew Educators Blog Hop. Here you will find my project and giveaways! The post is translated in English. Что такое блог-хоп? Коротко поясню: официальный блог Altenew организует одновременную публикацию работ группы дизайнеров, чтобы читатели могли переходить (от англ. hop — прыгать) из блога в блог по цепочке. / What is a blog hop? 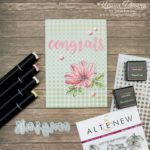 I will explain briefly: Altenew Card Blog organized a group of designers to publish their projects all at once so that readers could hop from one blog to another following the chain. Тема этого блог-хопа «Любимое». Я выбрала для своей открытки любимые техники: фон с помощью трафарета, раскрашивание штампов маркерами, вырубка для создания надписи. / The theme is “Favorites”. I’ve chosen my favorite techniques for the card: background using stencil, coloring with markers, die-cut sentiment. Сначала я нанесла зеленые чернила Altenew Crisp Ink из набора Green Fields с помощью трафарета Halftone и аппликатора, затем перевернула трафарет на 180 градусов и повторила то же самое с другим оттенком зеленого. Так получился оригинальный фон. / First I applied green Altenew Crisp Ink from Green Fields mini cube set using Halftone Stencil and an applicator, the I rotated the stencil 180 degrees and repeated with another shade of green. This is how I created the background. Контуры цветка и листьев из набора Perfectly Perfect я отштамповала черными перманентными чернилами и раскрасила спиртовыми маркерами Altenew Artist Markers. Надпись «congrats» я вырезала ножом для вырубки из набора Script Words и тоже раскрасила маркером. / Flower and leaves contours from Perfectly Perfect stamp set were stamped with permanent black ink and colored with Altenew Artist Markers. The word «congrats» was die-cut using Script Words die set and also colored with marker. Я приклеила надпись с помощью клеевых точек к полоске из кальки, и прикрепила ее и вырезанный цветок к фону открытки. Для акцентов я использовала эмалевые точки Altenew Enamel Dots. / I glued the sentiment to a strip of vellum with glue dots, then I adhered it to the background as well as the flower. For some accents I added Altenew Enamel Dots. Эти техники и приемы я изучила подробно, обучаясь на курсе Altenew Educator Certification Program, после окончания которого получила сертификат преподавателя. / I learned and mastered these techniques while studying courses for Altenew Educator Certification Program, and graduated with educator’s certificate. Продолжайте движение по блог-хопу! / Continue hopping! Altenew подарит сертификат на сумму $30 трем счастливчикам! Для участия в розыгрыше оставьте комментарий в блоге Altenew Card Blog до 23 января 2019. Результаты будут объявлены 25 января 2019. / Altenew is giving away $30 Gift Certificate to THREE lucky winners! Please leave a comment on the Altenew Card Blog by Jan. 23rd for a chance to win. Three winners will be announced on the Altenew blogs on 1/25/2019. Хотите выиграть сертификат на сумму $15? Оставьте комментарий к этой записи до 21 января 2019. Расскажите, какие продукты Altenew вам нравятся (что вы уже используете или хотели бы использовать). Результаты будут объявлены в моем блоге 22 января 2019. / Do you want to win a $15 gift certificate? Leave a comment below this post by 1/21/2019. Tell me which Altenew products do you like (that you’ve used or would like to use). The winner will be announced on my blog by 1/22/2019. P.S. Заранее прошу прощения за то, что не смогу ответить на каждый комментарий. Но уверяю, что внимательно все прочитаю! / P.S. Please forgive me for not answering each and every comment. I assure you that I’m reading all of them! Congratulations on becoming an AN Educator Irina! Love your card and the way you used the stencil in the background! Thanks for the inspiration and the giveaway! Beautiful card! I love the green background with your pink flower! I love the colors you used. Beautiful! Thanks for sharing! Such a beautiful card and thank you for the tutorial of the process!! So many wonderful encouraging words in support of this program! And such beautiful examples for all of our inspiration! 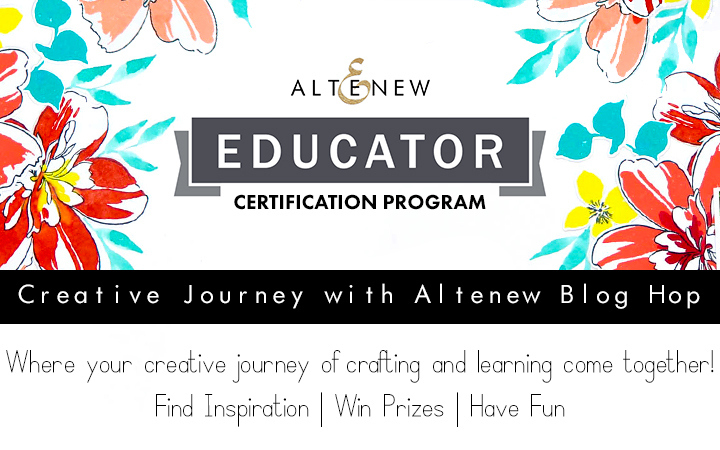 Altenew Certification Program is really about learning and sharing! Congrats on being an Altenew educator! Beautiful project, I love your coloring and card design! Love your card, it is very pretty. Thank you for the translations. That made it easier to understand. Oh Irina, I didn’t understand what you wrote, 😉 but I can see how you made a unique card using lots of altenew products. Stencile, marker ,stamp, ink , and die . This is really amazing . Your card is so soft and gorgeous. The added vellum make it so unique. Congratulations for being certified educator, enjoy your journey and wish you more success. Thank you Mindy! I believe you’ll like Watercolor Brush Markers! Wonderful card! The colors make me so excited for spring. Thank you for sharing your beautiful work. This is really beautiful and thank you for sharing your talent! Beautiful card. Love that background. Thanks for sharing and inspiring.